The past year has not been easy on Malaysians and their wallets. With the onset of taxes, removal of subsidies and instability at the workplace, stretching your dollar is not as easy as before, especially to include the little pleasures in life like a new car or a well deserved holiday. Fortunately, Grab has the answer. GrabCar, which is available on the Grab App (formerly known as MyTeksi), offers a flexible and viable option for those who want to earn some serious money with minimal time commitments. This is something other ride-sharing app platforms just cannot provide. So how does it work, you may ask … pretty easy, actually. With the updated Grab incentive system, the focus is not on the hours spent behind the wheel, but on how many jobs are completed. For example, on weekdays (Mon – Thurs), you only need to accept one job while on the way to work and two after. 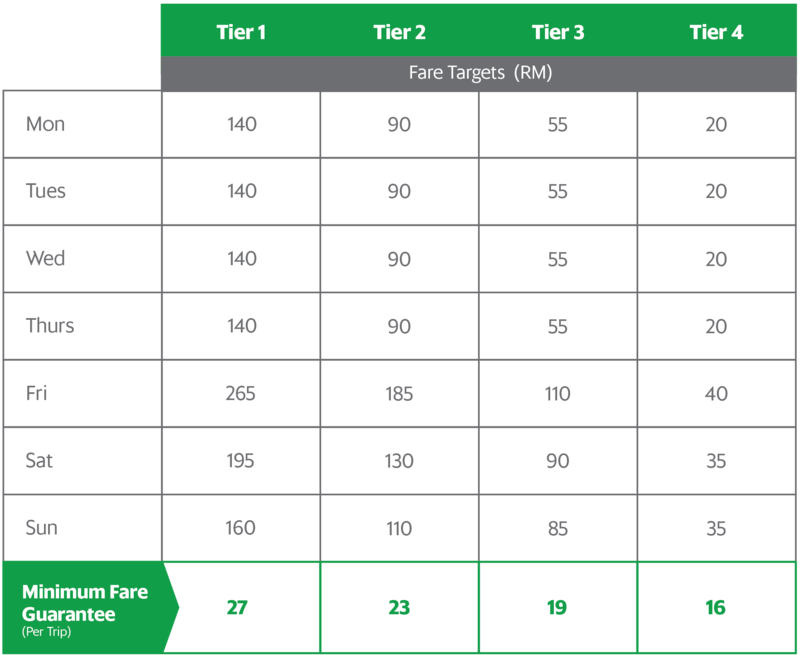 With the minimum fare of RM7 per job, you will already hit the tier 4 target, which will reward you with a bonus incentive that rounds up each job to RM16, making your daily earnings RM48. Then, on weekends (Fri – Sun), if you could accept five to six jobs a day with the same minimum fare of RM7, each job will also be rounded up to RM16, turning your daily earnings to between RM90 and RM96! A trip to Bali or Bangkok every month! The possibilities are endless. And they’re all available to you, just by sitting in your car for a few hours a day, listening to your favourite music and meeting new people. In fact (just between the two of us), here are a few more tips to consider if you want to earn even more! 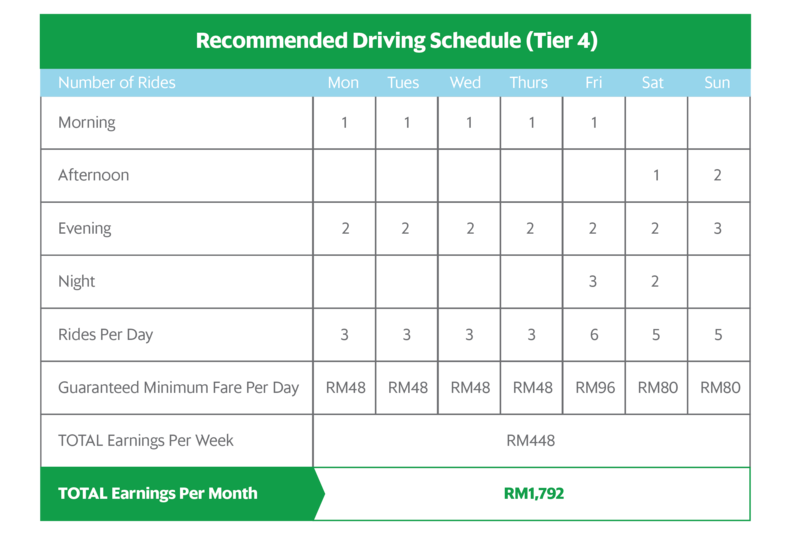 Bonus Hours, which usually coincides with office rush hours, are when Grab guarantees the minimum fare earned, so you can definitely earn more with lesser drive time. Another tip to maximize your earnings is by reducing your cost. Since it is now cheaper to fill your tank with petrol than to enjoy a glass of Milo ais at your nearest mamak, now is the best time to take advantage of it! Signing up has never been so easy! All you need is your NRIC, a valid driving license and the cover note of your car insurance. Grab will also give you RM50 for signing up on this particular day only! So with the Express Sign-Up, you’ll start earning in no time! Step 2: Register by keying in the required details and upload the necessary documentation (NRIC, valid driving license, cover note for your car’s insurance and a profile photo). Step 3: Attend a quick driver briefing. * Gross income does not include petrol cost and Grab’s commission applicable to the base fare without incentive.